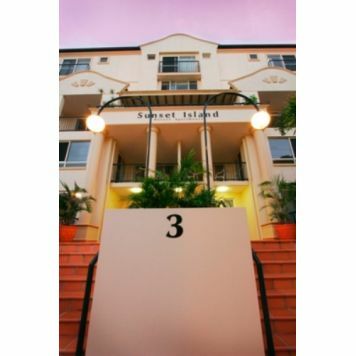 Nestled at the end of Peninsular Drive, Sunset Island Resort provides exclusive boutique holiday accommodation. 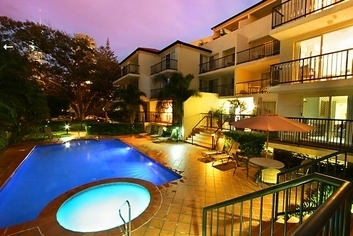 The Resort is just a short walk to Cavill Mall, and on to the renowned and pristine beaches of Surfers Paradise, Gold Coast, in the heart of Queensland's celebrated and sought after holiday destination for the discerning holiday makers from around the world. It is the perfect spot to relax by the saltwater pool or soak in the spa, and enjoy the quiet ambience of the resort. With the river so close you can take the kids fishing. 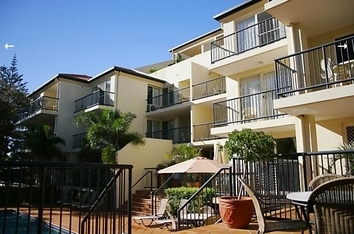 Or experience the fantastic atmosphere of Surfers Paradise - a hive of activity and sun-worshipping fun, almost endless beaches, and numerous cafes and shopping areas. For the more adventurous, the theme parks aren't far away, and the hinterland with its mountains, rainforests and wineries is a great place for a few hours away from it all. You will love every minute of your stay with us here at Sunset Island Resort. Our well-appointed apartments are equipped with all the essential features and appliances to ensure your stay is enjoyable and relaxed. 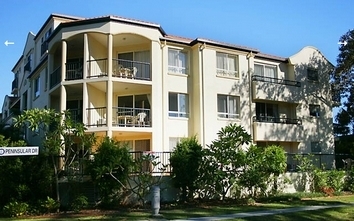 The one and two bedroom apartments and tri-level two-bedroom penthouse apartments are all air conditioned and have their own balconies and spacious living areas. Fully self-contained, each apartment has a modern kitchen with granite benches and full amenities including a microwave and dishwasher, and your own personal laundry has as a washing machine and dryer. Resort facilities for your comfort and relaxation include saltwater swimming pool and spa, barbeque terrace, tropical landscaped gardens, free undercover security parking and of course, our well-known tour desk. 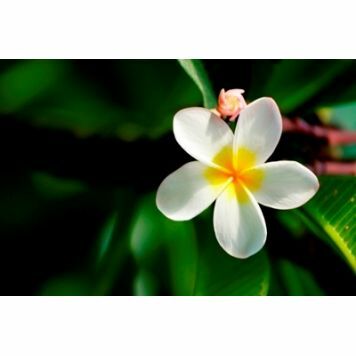 We pride ourselves on our friendly service, and our aim is to ensure you have a memorable, comfortable and relaxing holiday. We want to see you come back time and time again! Rates are for 2 people. Maximum occupancy 4, extra guest cost $35. All apartments have fully equipped kitchens, colour TV, security intercom, wireless internet, modern elegant decor and furnishings with air-conditioned living areas. Rates are for 4 people. Maximum occupancy 6, extra guest cost $35. All apartments have fully equipped kitchens, colour TV, security intercom, wireless internet, modern elegant decor and furnishings with air-conditioned living areas. Rates are for 4 people. Maximum occupancy 6, extra guests $35 per night. All apartments have fully equipped kitchens, colour TV, security intercom, wireless internet, modern elegant decor and furnishings with air-conditioned living areas. Rates are for 4 people. Maximum occupancy 6, extra guest cost $35. 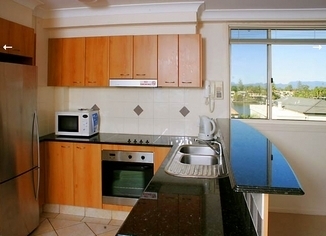 All apartments have fully equipped kitchens, colour TV, security intercom, wireless internet available, modern elegant decor and furnishings with air-conditioned living areas. Rates are for 4 people. Maximum occupancy 8, extra person $35 per night. All apartments have fully equipped kitchens, colour TV, security intercom, wireless internet, modern elegant decor and furnishings with air-conditioned living areas. 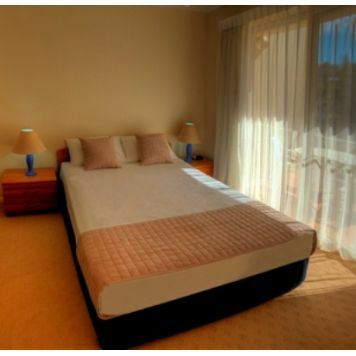 All rates are based on 2 guests in a one bedroom apartment and 4 guests in a two bedroom apartment (including penthouse). Extra person charges are $30 per person per night, payable on arrival. Infants 0-2 years free of charge. Cot hire available - charges apply. A 25 minute drive. Tourist shuttles, taxis, limousines, car hire and Surfside buses are available at the airport. 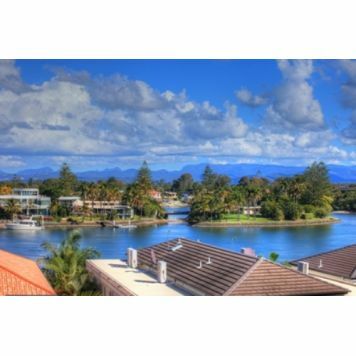 Head north on the Gold Coast Highway from Coolangatta. Continue past Jupiters Casino in Broadbeach (you are still on Gold Coast Highway), and on your left is a sign and bridge to Isle of Capri and Ashmore Road. Continue past here to the set of lights where there is a free left turn into Peninsular Drive. Go straight through the roundabout, and Sunset Island Resort is on the corner of Peninsular Drive and Sunset Boulevard (the next road on the right). A 1 hour drive. Tourist shuttles, taxis, Airtrain, limousines and car hire are available at the airport. Head south on the Gateway (M1) and Pacific Motorways. You will pass Dreamworld on your left, pass Smith St (Exit 66) on your left, and then turn off at Nerang North (Exit 69). Turn left onto Southport-Nerang Road then right onto Ashmore Road stay on Ashmore Road until the end where you will cross the Isle of Capri Bridge and meet the Gold Coast Highway. Continue past here to the next set of lights where there is a free left turn into Peninsular Drive (formerly Whelan St). Go straight through the roundabout, and Sunset Island Resort is on the corner of Peninsular Drive and Sunset Boulevard (the next road on the right). ALL the Theme Parks. Sailing, windsurfing, kayaking, jungle buggy rides, deep-sea fishing, scuba diving, glass bottom boat lagoon cruises, mountain treks, 4x4 safari tours, cultural village tour, massage and beauty treatments, day tours to other islands.